Qatar Airways has confirmed it is acquiring a stake in American Airlines – introducing an extraordinary twist into the long-running dispute between America’s three biggest airlines and various Gulf state carriers. The Washington Post reported Qatar planned to buy “at least a 10% stake” in American. But Qatar later said it would not exceed 4.75% – which happens to be the most American Airlines allows without advanced approval from its board. “Qatar Airways has long considered American Airlines to be a good oneworld Alliance partner and looks forward to continuing this relationship,” the Gulf airline stated. 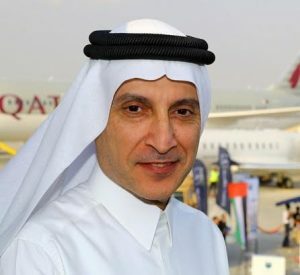 The Washington Post quoted a letter to employees by American’s chief executive Doug Parker, who said he was puzzled by the Gulf carrier’s interest, given that the two airlines have been at loggerheads over accusations of government subsidies. The big three US carriers – American, United and Delta – claim the Gulf carriers are subsidised by their governments, a claim the Gulf carriers vehemently deny. “While anyone can purchase our shares in the open market, we aren’t particularly excited about Qatar’s outreach,” Parker wrote. It is unclear quite what Qatar Airways would achieve by buying into an airline where both management and unions oppose it. Qatar, a tiny country smaller than metropolitan Sydney, is currently engaged in a diplomatic fight with Saudi Arabia (with which it shares a border). Saudi Arabia and the others have now delivered an ultimatum to Qatar, insisting that it shut down news service Aljazeera, along with other demands. Qatar plays host to an important US military base. The US Combined Air Operations Centre (CAOC), defended by 11,000 US troops, operates from Al Udeid Air Base near the Qatari capital of Doha. It provides command and control of air power throughout Iraq, Syria, Afghanistan, and 17 other countries. Might be written up as a Qatar Airways investment. But it is not. It is the sovereign wealth fund of Qatar. Qatar Airways itself has no money to invest. It loses about three quarters of a billion each year. Al Bakar has a reputation that precedes him. Let us leave it that it is not a very nice one. Qatar Airways took a very large stake of a similar size in IAG: owner of British Airways, Iberia, Aer Lingus, new carrier Level and LCC Vueling.